When you travel like we do—making the most of every minute you can squeeze from vacation time—there are certain things you do that become second nature over time. For one, you know you are going to trade some sleep in exchange for some extra time sightseeing. You also know wasting any amount of time can throw off your itinerary to the point you don’t get to do everything you hoped you would. 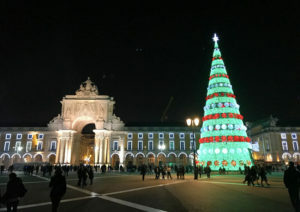 That’s why Adam and I were particularly dismayed when our visit to Lisbon started with two hours in the immigration line at the airport. 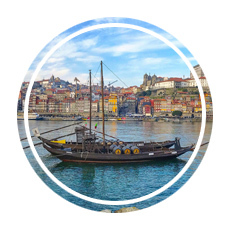 Flying from the USA’s east coast to Europe usually means an overnight flight, and since Portugal is on the coast of western Europe, we were in for a short flight with little chance of getting any sleep. 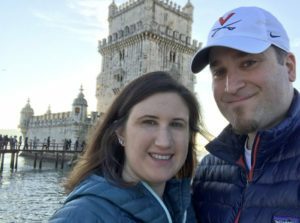 After four and a half hours from Boston to the Azores, where we connected, followed by two hours from the Azores to Lisbon, we landed sleepy but committed to hitting the ground running. We had a lengthy list of places we wanted to see in the two days before we left for Porto, which meant we had a tight timetable to keep. So when we rounded the corner to join the immigration line, we were not thrilled to find about 500 people waiting in front of us. Yikes. It took just under two hours to make our way to the front of the line; I know this because I checked my watch just about every minute as I monitored our progress. I mourned every second that ticked away, mentally shuffling our schedule around to condense it and repack it into the limited amount of daylight we had remaining on our first day. When our passports were finally stamped and our luggage rescued from the lines of suitcases waiting for their owners to also clear immigration, we made a mad dash for the Lisbon metro. Just 30 minutes later, we were checked into our hotel, and after showering and changing into clean clothes we were off to our first stop: Belém. Belém is a small neighborhood in the southern part of Lisbon. 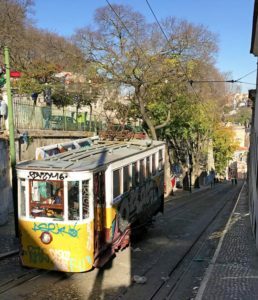 While it’s fairly popular with tourists, it’s not the most accessible part of the city; Lisbon’s metro does not run there, so most visitors take a taxi or a tram to reach it. We opted for a taxi. Although I am a staunch proponent of taking public transportation whenever possible, our lengthy wait in the immigration line delayed us to the point that the sun was getting ready to set, and I wanted to visit Bélem with some natural light. 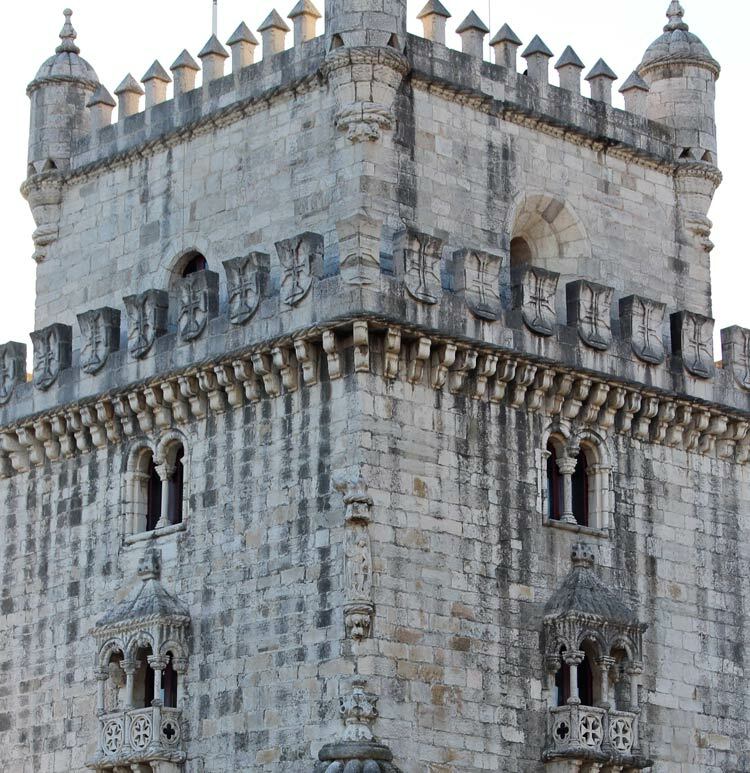 We started at the Tower of Bélem, a truly beautiful structure with ornate stonework that dates back to 1519. 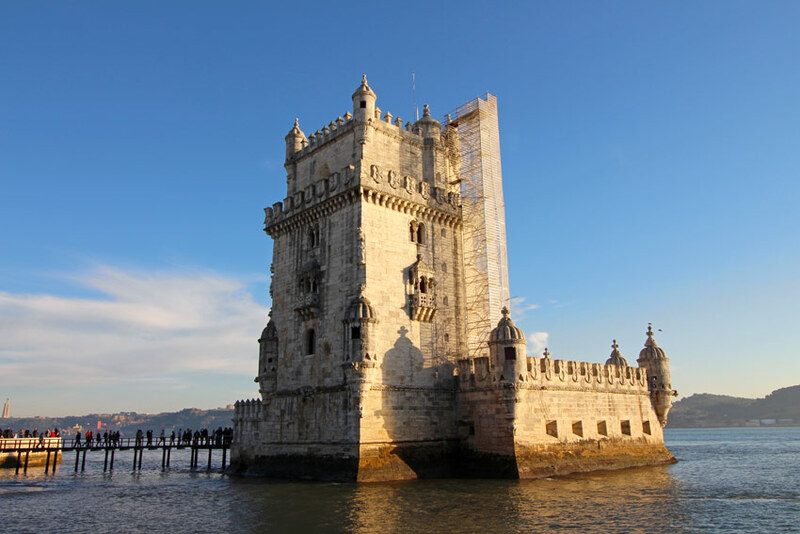 It was originally commissioned by King John II in the late 1400s as part of Portugal’s defense plan; it also served as a more ceremonial gateway from Lisbon to the world, as many ships headed for parts unknown departed from Portugal during the Age of Discoveries. 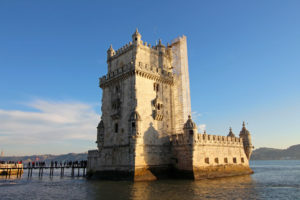 The tower itself is four stories tall and made of limestone, so it’s impossible to miss and is a natural place for people to gravitate toward when they arrive in Bélem. The sky was just starting to change from blue to gold and pink when we arrived, so while I was still a little upset about our wasted time at the airport, we wouldn’t have seen the Tower of Bélem against such brilliant colors if we had arrived earlier. 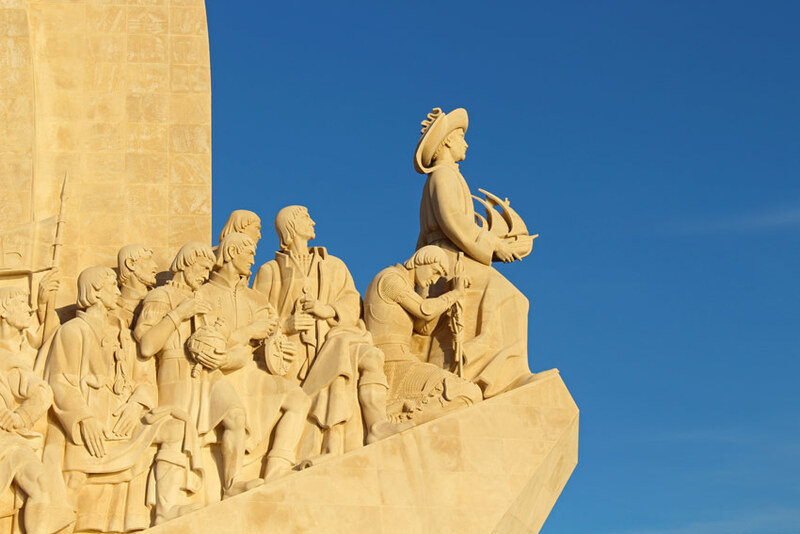 Just down the street from the Tower of Bélem is the Padrão dos Descobrimentos, or the Monument to the Discoveries. This quickly became one of my favorite sights in Lisbon (and, in retrospect, all of Portugal). The monument is fairly new; finished in 1960, it’s not even 60 years old. 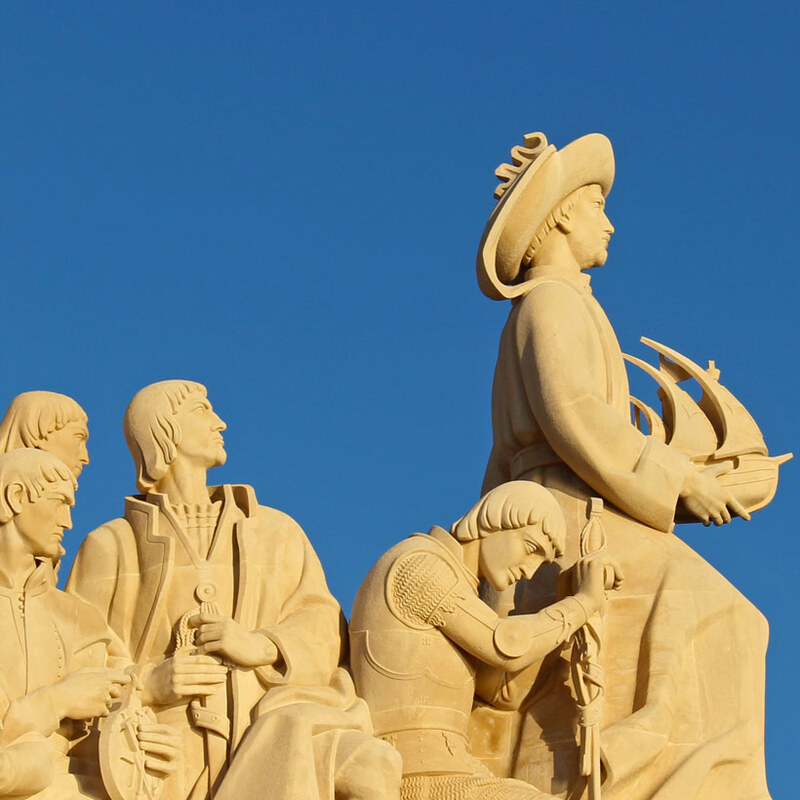 The Monument to the Discoveries features 33 of the explorers, scientists, monarchs, and others who were so instrumental in Portugal’s role in navigating the world. With Henry the Navigator’s statue at the forefront, familiar historical figures like Vasco de Gama, Magellan, and Cabral look out at the Tagus River where their flesh-and-blood counterparts once set sail to see what existed beyond the horizon. Honestly, I felt that spot to be the most inspiring place I visited on our trip to Lisbon. Maybe it was the way the sun made the monument take on a golden hue, maybe it was because the new year was imminent and a fresh start of my own was on my mind, but I was glad we didn’t miss Padrão dos Descobrimentos. We made one final stop before dusk gave way to nighttime: the Jerónimos Monastery. 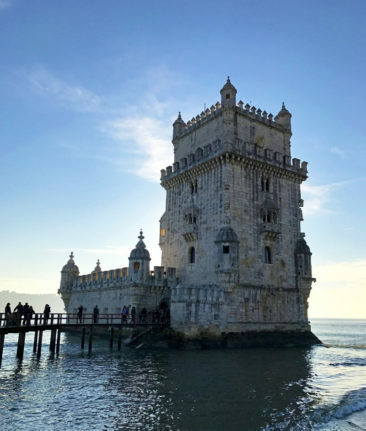 Like the Tower of Bélem, the monastery is a UNESCO World Heritage site; we love to seek out UNESCO sites when we travel, and this one was a great find. 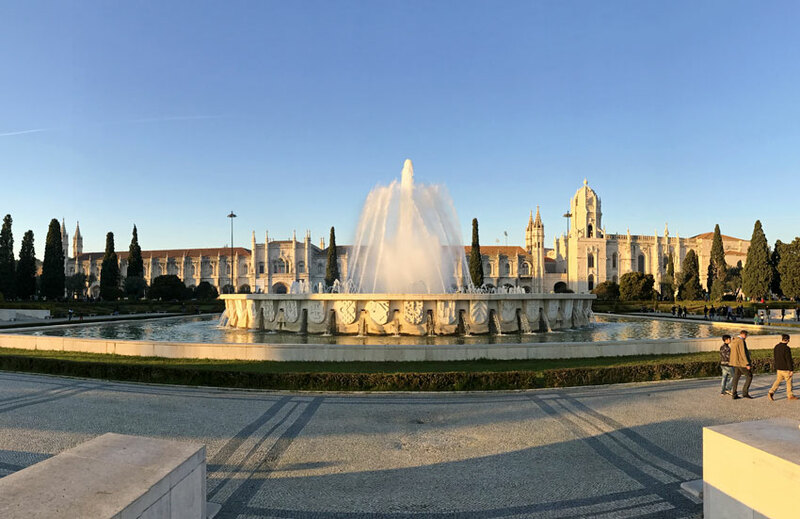 It’s spectacular from an architectural perspective (if you want to see the Portuguese gothic style, Jerónimos Monastery and the Tower of Bélem are great places to go!). While the monastery is now home to a few museums that offer tours, we didn’t have a chance to visit them since it was pretty late in the day. Instead, we walked a few blocks down the street to indulge in the ultimate Lisbon snack. Pastel de nata is a popular snack in Portugal; it’s an egg custard tart that you can find in virtually every bakery in the country. 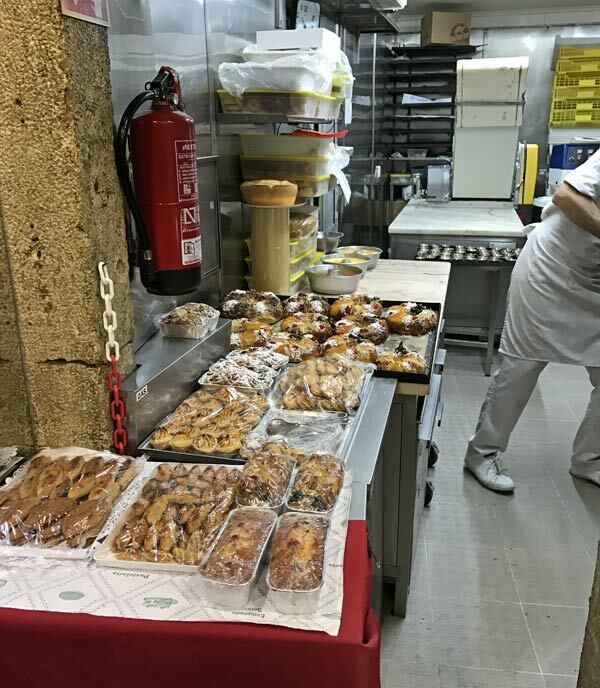 We had it on good authority that no one makes a better version than Pastéis de Bélem, and as soon as we saw the line snaking its way down the sidewalk we knew plenty of others share that opinion. As it turned out, the huge line outside was just for takeaway, so we joined a much shorter line inside to wait for table service. There were several lines inside, one for each seating area in the bakery, and we ultimately committed ourselves to the line for the largest of the seating areas. When we finally sat down after a 40-minute wait, we quickly ordered some pasteis de Bélem (they don’t call them pastel de nata here!) and a couple of cappuccinos. The cappuccinos, for what it’s worth, were fantastic, just what we needed to warm up after a brisk walk in the cool winter air. As for the pasteis de Bélem, they were worth the wait. Flaky, buttery shells crumbled when we bit into them, and the creamy egg custard dusted with a bit of powdered sugar and cinnamon delivered just the right amount of sweetness. We went on to sample similar pastries throughout the country, but we still declared these the best we tried. Served warm, they were cooked perfectly (not too burnt, not in any way underdone). We ordered two a piece, and we were glad we did—the pastries are not very big, and chances are you’ll be craving a second one before you even finish your first one. 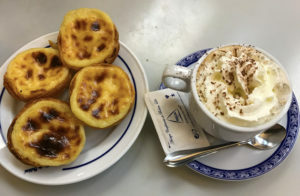 Warm from our coffee and satisfied with our snack, we decided we had enough energy for a final stop, so we hailed another taxi and departed for the Praça do Comércio. We arrived long after dark and were greeted by both the Arco de Rua Augusta and a huge Christmas tree that lit up the courtyard with festive cheer. 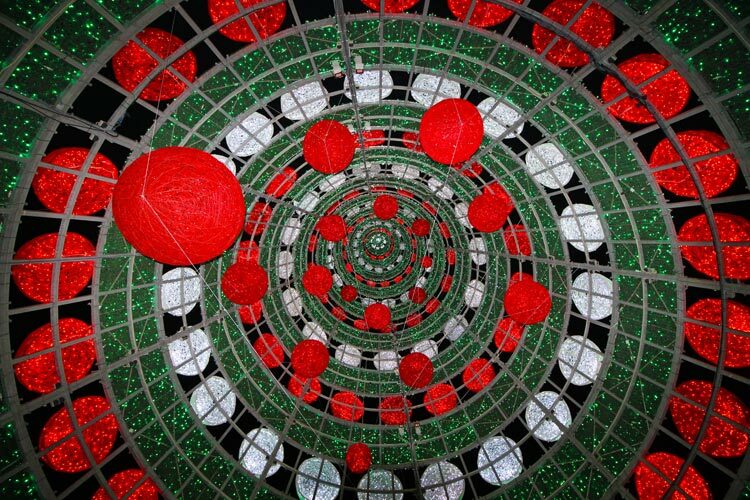 Worth a walk around anyway, we were excited to find the Christmas tree was big enough to walk inside, which afforded a pretty unique view of the lights when looking up. The Arco de Rua Augusta is an enormous arch that rises 100 feet in the air. 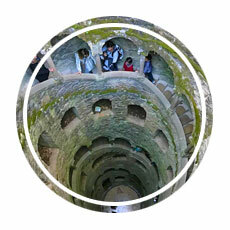 It is one of the iconic photo locations in Lisbon– and for good reason! 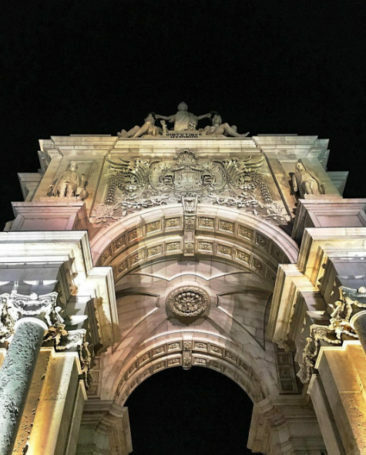 The Rua Augusta Arch commemorates Lisbon’s reconstruction after the 1755 earthquake, which was estimated to have been around a 9.0 magnitude quake. 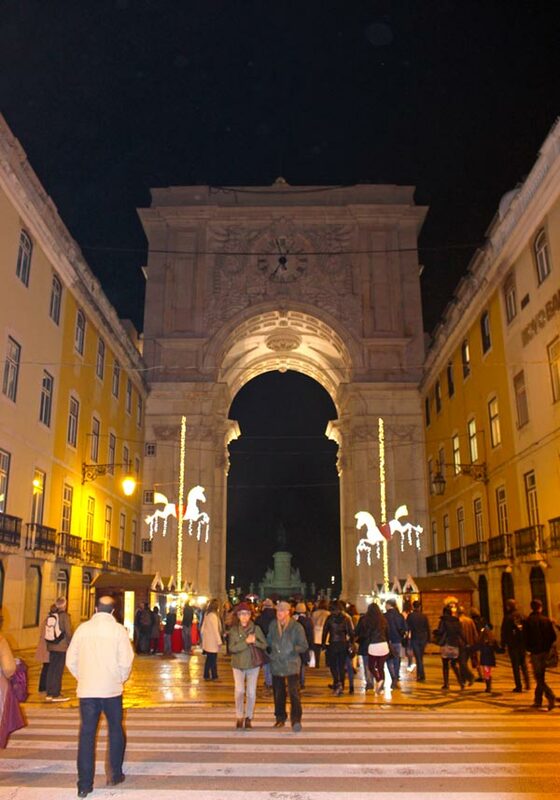 Beyond the arch is Rua Augusta, which is lined with shops and restaurants. We stopped a handful of times, mostly to watch a variety of local street artists perform. 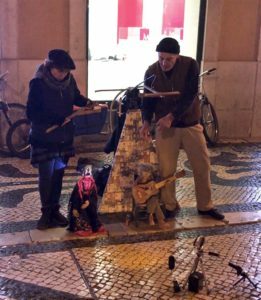 Our favorites were a man and woman who used marionettes (Video) to perform a collection of Fado songs. It was easy to get lost in their genuine talent and the Fado song’s haunting sadness. Our final stop of the evening was unexpected; the road ended at the Praça Dom Pedro IV near Rossio Square, which had been transformed into a beautiful Christmas market! 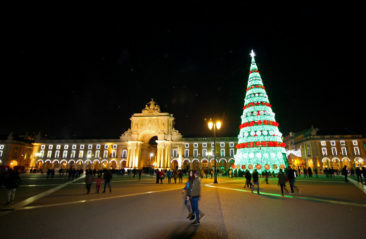 We started with a visit to one of the shops selling Christmas-themed souvenirs, and ultimately we splurged on a couple of glasses of mulled Port wine (Glühwein) that we enjoyed in front of a Christmas tree while watching tourists and locals as they ate, shopped, and passed through the market surrounded by buildings adorned in holiday lights. 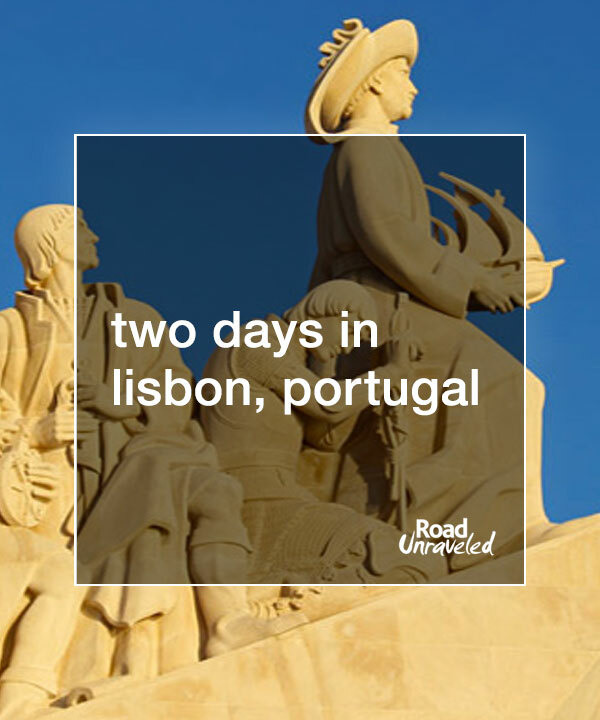 Our Lisbon adventure continued two days later; since we spent our first full day in Portugal exploring Sintra, it wasn’t until our second full day that we turned our attention back to Lisbon. To experience the city, we booked a tour through Urban Adventures. We have taken incredible tours with them in the past (notably in Kuala Lumpur, Venice, Singapore, and La Paz), so we knew we were in for a great historical education and some tasty snacks along the way. 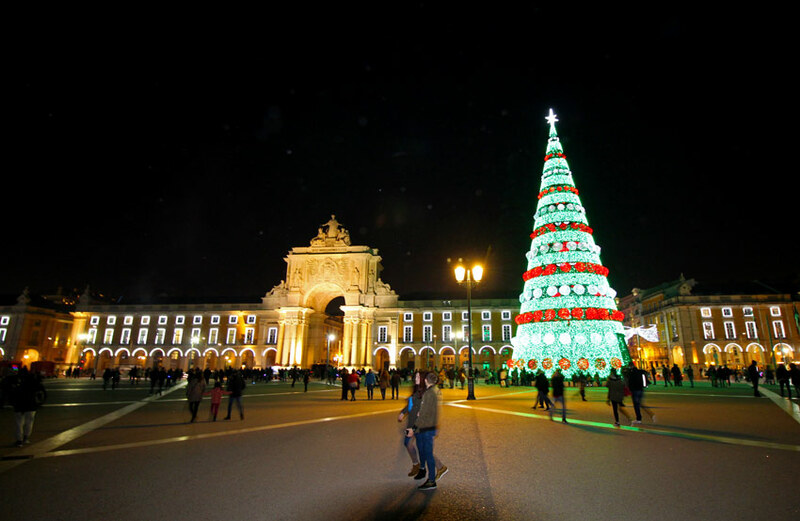 We met in Restauradores Square in front of an enormous monument that pays tribute to Portugal’s independence in 1640 and the start of the Restoration War that ended Spanish rule. 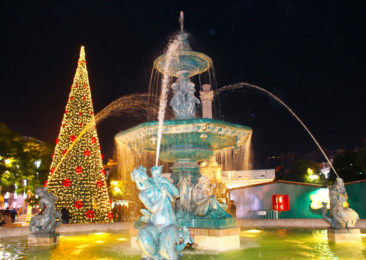 Our tour began where our first evening in Lisbon ended, in Rossio Square, not far from the Christmas market. Our guide Hugo brought Lisbon to life as he pointed out a variety of restaurants, bars, and historical buildings that make up the flourishing Lisbon landscape, leaving us wishing we had more time to spend in the city. 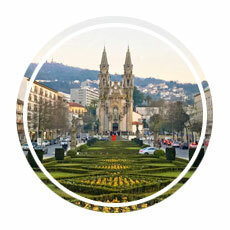 We dipped into beautiful churches and admired the historic residential neighborhoods. We heard a lot of fun stories about life in Lisbon. 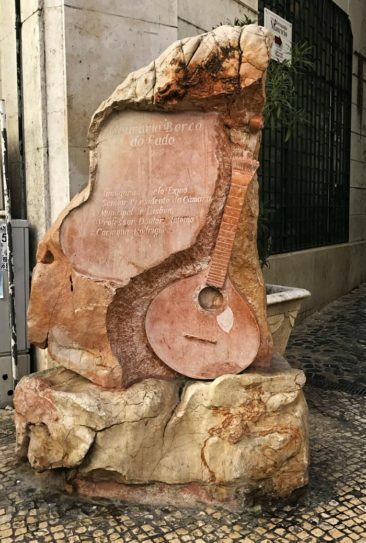 Among our favorites was the story of Fado, Portugal’s famous music that couples melodies played on the Portuguese guitar with lyrics singed with melancholy. Fado dates back to the 1800s and can be enjoyed throughout the country, though Lisbon is home to the more well-known spots to hear it. And, since this doubled as a food tour, we ate. Our first stop was a small bakery down an alleyway and up a staircase in a spot I would never have discovered as a tourist. 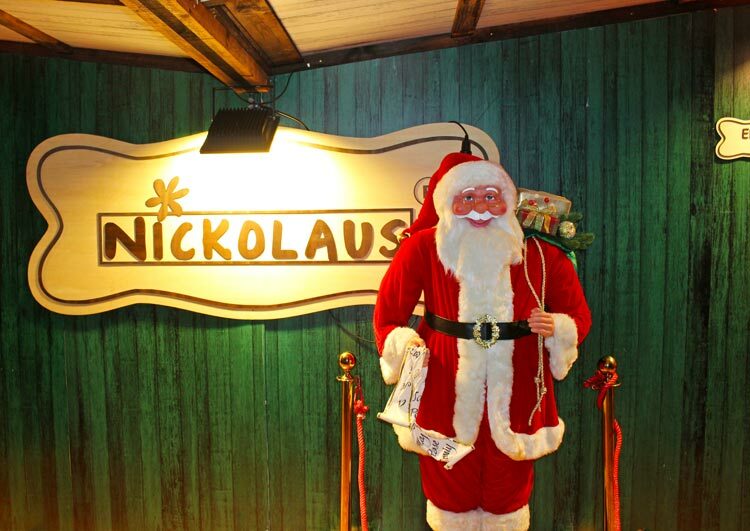 They served us pastel de nata and a special seasonal fruitcake only enjoyed during the holidays. We savored the snacks and sipped espresso while the baker was hard at work developing more mouthwatering treats on the other side of the wall. 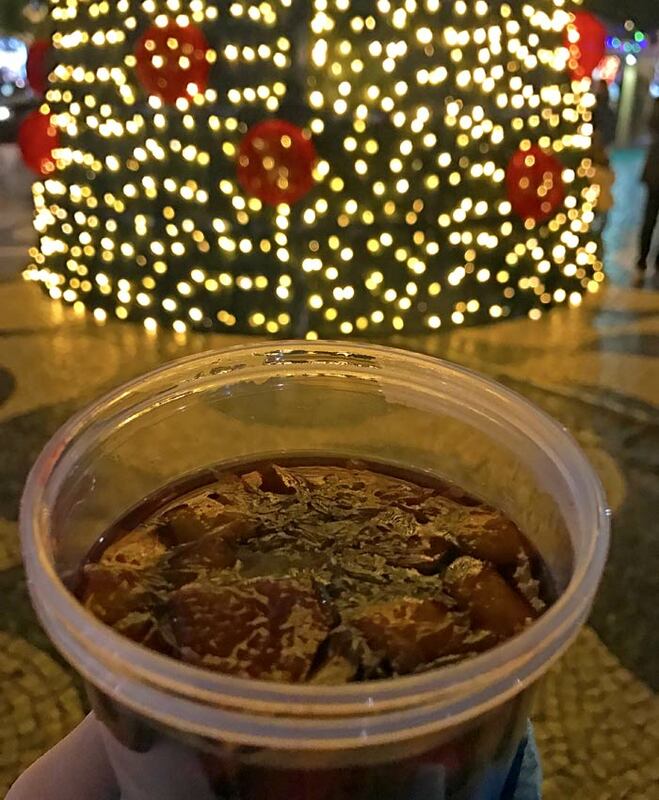 We sampled local cheese and marmalade and washed it down with port, which was rich and sweet and brought out the nutty flavors in the cheese and the richness of the marmalade. These snacks fueled our climb up several lengthy staircases to reach Bairro Alto, a wonderful viewpoint where we sat with new friends from around the world drinking Sagres (a local beer) and admiring the beautiful cityscape below us. Our final adventure took us across the Tagus River by way of a 10-minute ferry ride, where we stopped into a restaurant for some local seafood and wine. 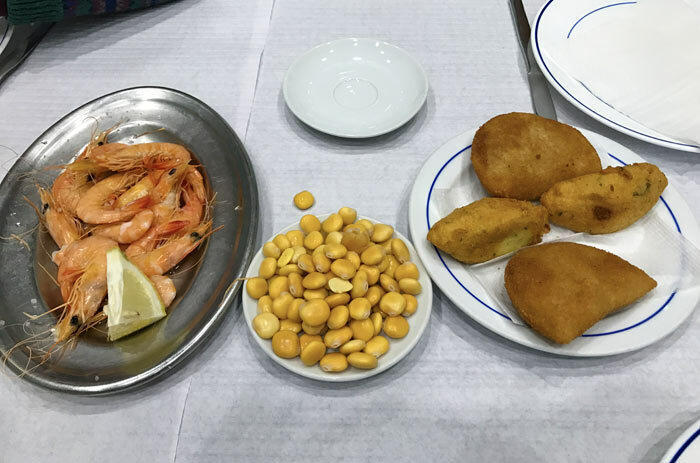 Here we tried warm breaded seafood cakes, fresh prawns, and crunchy lupini beans, which are a bit like edamame in how they are eaten. This stop also introduced us to vinho verde, or green wine. Vinho verde, as it turns out, is not green at all; it’s simply a very young wine that is bottled before given any real time to age in a barrel. This particular vinho verde had a light effervescence and was easy to drink; light and crisp, it would be an ideal summer wine—although drinking it in the winter wasn’t a bad idea, either! Our tour ended with a ferry ride back to the other side of the river and a round of goodbyes to Hugo and the great people we met that day. 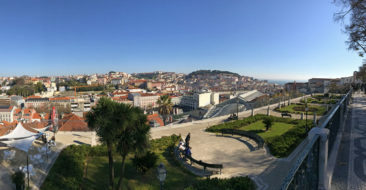 Within 90 minutes Adam and I had returned to our hotel, claimed our luggage, and taken the metro from one side of the city to the other in preparation for our train ride from Lisbon to Porto. It was a whirlwind couple of days in Lisbon, and like so many places we have seen and loved, we could have spent much more time there. I loved the relaxed vibe and the beautiful architecture the most. 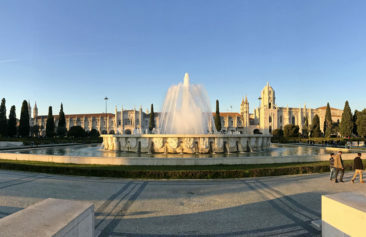 Combined with a fascinating history, friendly locals, and great food, I felt a bit sad that it took us so long to seek out Lisbon in the first place. 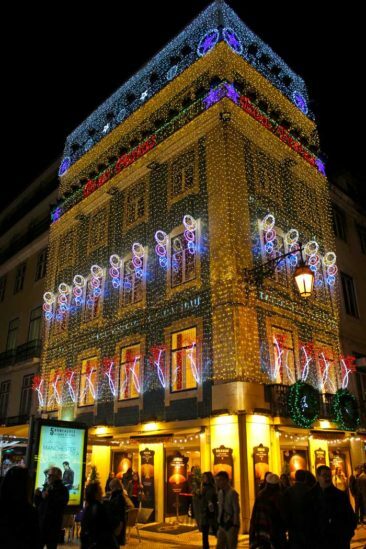 The Corinthia Hotel Lisbon is one of our favorite hotels in the world. It’s located directly across the street from the Jardim Zoologico, and it provides unparalleled comfort for a very reasonable price. We liked the fact the building itself is very secure (including key access in the elevator), the breakfast buffet was enormous with a terrific selection, and the rooms were clean and incredibly quiet. Better still was the staff. They were kind, welcoming, helpful, and stopped at nothing to be sure we had a wonderful stay. If you are visiting Lisbon, this is a wonderful hotel to consider. Should you spend just two days in Lisbon? While I think the city demands much more, if two days is all you have don’t let the chance pass you by. We knew what we wanted to see and booked a great tour to ensure we didn’t miss out on the important sites and local experience, so we feel that we spent every minute of our time well. And in a way, it is nice to know we left a few stones unturned—that means our next visit will offer just as much to us when we return. 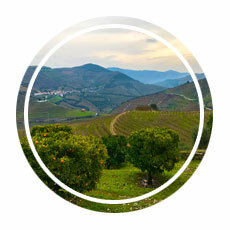 Planning to spend some time exploring Portugal? 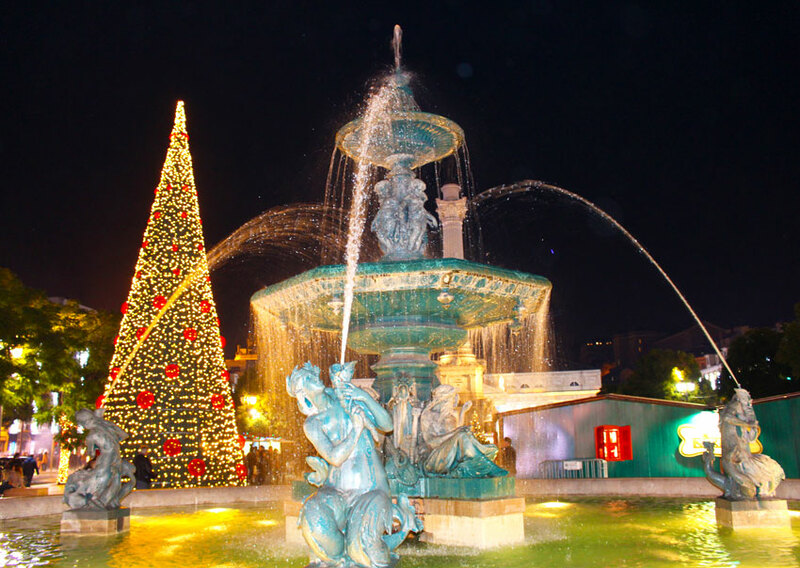 Don’t miss these great posts to help you plan your trip! * From time to time, our travels are directly impacted by a service or company. In this case, we booked a day tour with Urban Adventures, and this post includes our candid review of our experience. We selected Urban Adventures based on our own research and travel needs; we were not offered and did not receive compensation of any kind from them or any other party in exchange for our review.